Reports posted subsequent to Jim’s astronomical observation and astrophotography events. Venus (upper right) and Mercury (lower left) are in close conjunction on the date of this post. 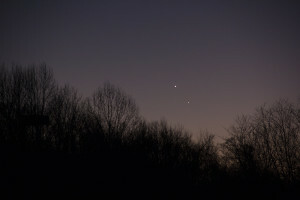 The accompanying image was taken on the day before conjunction, and just before the two planets followed the setting Sun below the western horizon. I happened to be at Howard Astronomical League’s Alpha Ridge dark site for an observing session, and had forgotten about the conjunction. Once I spotted the pair on the horizon, I did not have enough time to set up the camera on a tripod, so I steadied myself on the Jeep’s spare tire for a quick, unguided exposure. The Complex Ion Tail of Comet Lovejoy by V. Popov & E. Ivanov from Astronomy Photo of the Day, 01/21/2015 (http://apod.nasa.gov). 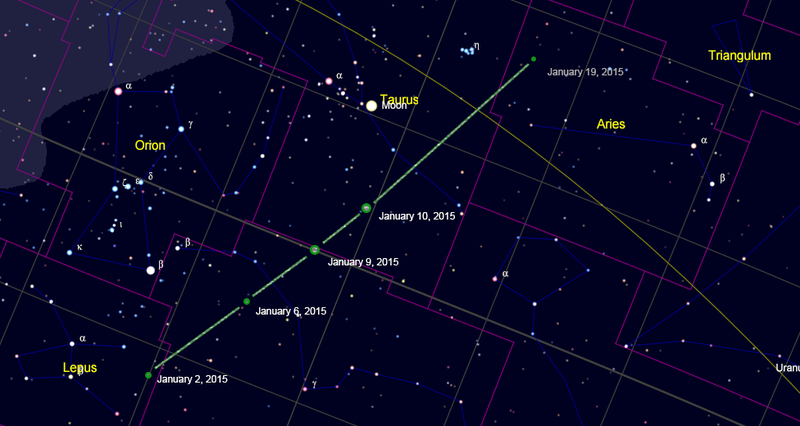 Comet Lovejoy (C/2014 Q2) will be visible throughout month of January and into February. It will be difficult to view without binoculars during the first week of each month until the Moon’s phase progresses a few days beyond full Moon. For a few days starting around January 7th, look for it as a naked eye object to the west of Orion, moving toward the north, northwest for the rest of the month. Sky & Telescope magazine published an article on Comet Lovejoy that includes star charts to help locate the comet, and periodic updates to report the latest observations. A log of my observations of this comet will follow below, and I will track it’s location on the star chart at the end of this post. Briefly observed Comet Lovejoy with binoculars. It seems that it remains bright enough for binocular observation for some time to come in spite of the Moon’s increasing phase (one day past 1st quarter today) and brightness. It has moved off of the tracking chart at the bottom of this post, so I need to remake the chart. Clear skies are expected tomorrow evening, so be sure to catch a glimpse. The tracking chart in Sky & Telescope below is the best means to locate the comet. Tonight was by far my best observation of Comet Lovejoy. I continue to be amazed at how fast it has tracked across the sky since I first observed it on January 6th – see the tracking chart below. I was not able to see it with the naked eye, and there was as usual, no color in the coma and no tail could be discerned. I set up the NP101 on the Losmandy mount as the guide scope, and I piggybacked the Canon EOS 60Da on top. The image below is the result of 67 stacked subexposures of 45 seconds, at f/5.0, ISO 1600, FL=29mm. The image covers approximately 35 degrees x 35 degrees sky, and was processed in Deep Sky Stacker and PhotoShop. More processing is needed to even out the background. The image otherwise looks pretty decent in a “fit screen” enlargement, but a 100% or greater enlargement amplifies the shortcomings of the camera’s zoom lens. The comet, at lower center, clearly shows off its green hues, and the tail can be seen extending upward from the coma. Also in the image are the Hyades star cluster and Aldebaran (brightest star) of the constellation Taurus in the upper left. Above and to the left of the Hyades is a much smaller and dimmer star cluster, NGC 1647. At center are the bright Pleiades, and the California Nebula is the reddish smear near the right center edge. Click to enlarge for more detail. Comet Lovejoy with Hyades, Pleiades, and California Nebula by Jim Johnson, January 19, 2019. The most amazing aspect of this observation is how much the comet has moved since just last night! This was my first look at the comet through the telescope, and my objective was to see, or image the tail. Try as I might, but I was still not able to discern any green color or tail at the eyepiece. I mounted the 60Da on the telescope, and I captured about 40 frames of the comet at ISO 1600, exposing each frame for 68 seconds. The star field turned out within the range of what I am accustomed to seeing. 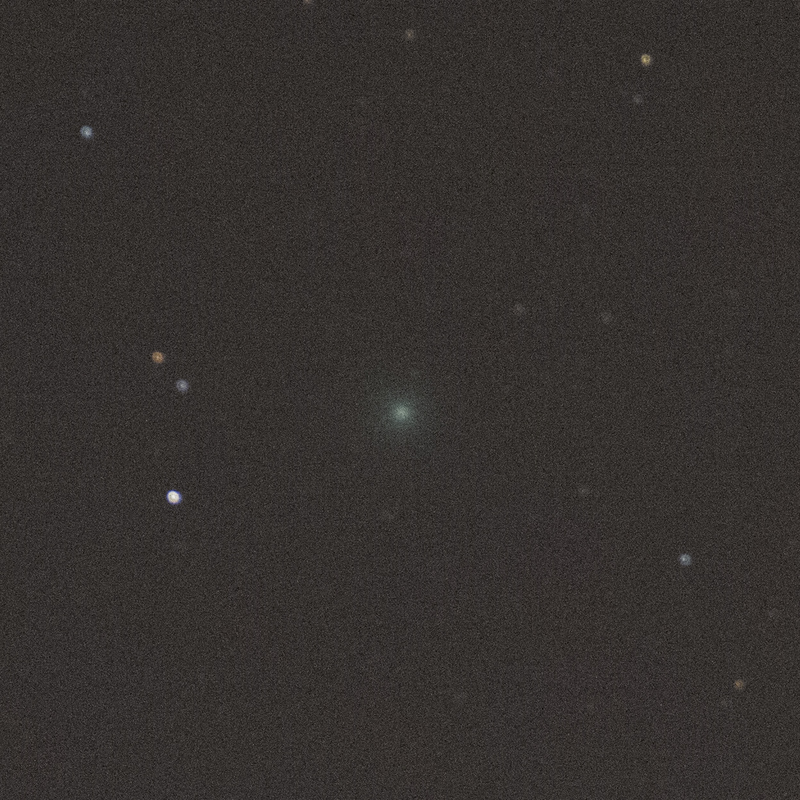 As for the comet itself, no matter how I attempt to stack the frames or process the image, there is no green tint, and no tail. Since I was pushing the exposure time, I expected the center of the coma to be blown out by over exposure while the dimmer edges to show the greenish cast like last night’s image. The coma, however, is completely blown out by overexposure and no greenish tint can be seen at all. And most disappointingly, no tail can be discerned in any of the images. This is surprising since I have seen other images where both coma and tail are both visible and both with a greenish tint. I certainly expected the tail to be visible if the coma is overexposed. I will read up on imaging comets to learn what I can from this experience, and try again. Tonight was my first opportunity to observe the comet under a clear sky that was not washed out by a bright moon. Visually, I was able to spot the comet with my unaided eye once I had located it with the binoculars. I appeared brighter in the binoculars tonight than it did on January 6th. The absence of moonlight or the fact that the comet is expected to reach its peak brightness for this pass through the Earth’s neighborhood could account for the brighter appearance. I was not able to detect a green tint, or the tail with either my own eyes, or the binoculars. The green tint can be clearly seen in this single, unguided, 4-second exposure (FL=135, f/5.6, ISO 6400). I hope put a guided telescope on comet soon, and hope to be able to discern the tail in the resulting images. 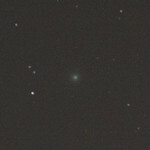 I was able to observe Comet Lovejoy again tonight at about 8:30 EST. The sky was crystal clear, but the waning gibbous Moon had risen about an hour before Lovejoy had ascended above the treeline in my back yard. It was located on an imaginary line drawn from Saiph through Rigel in Orion, and about 1 1/2 times that distance again. It was slightly larger and brighter than my last observation. I looked carefully, but still could not discern the tail, and I could not see the comet without binoculars. 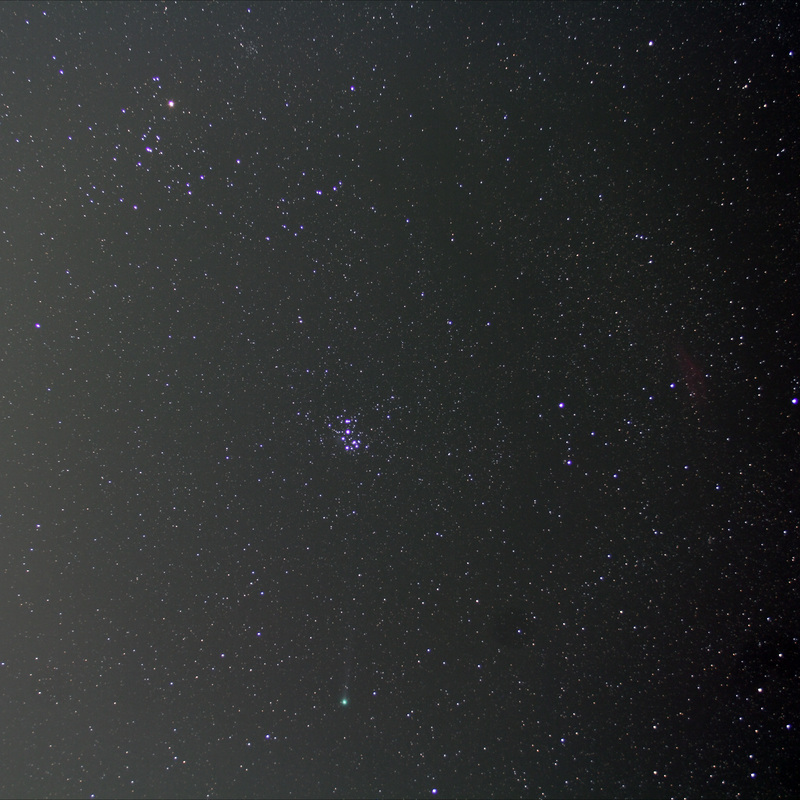 I went outside last night just before 9pm for my first look at Comet Lovejoy. I knew that the the nearly full moon would keep me from viewing it without optical aid, so I studied the star charts to make sure that I knew where to look. My star hopping plan was easy: start with Mintaka at the left end of Orion’s belt, draw an imaginary line downward to Rigel, and proceed that distance again to Lovejoy. Once outside, I put the binoculars on that location and there it was! It was not nearly as bright as the nearby Orion Nebula (M42), but it appeared as a faint circular blob of about one-half the size of the full Moon. I was not able to see the tail at all. Because it was so dim, I was not able to detect the green color associated with diatomic carbon molecules in the comet’s gaseous halo and tail that are fluorescing in the Sun’s ultraviolet rays. 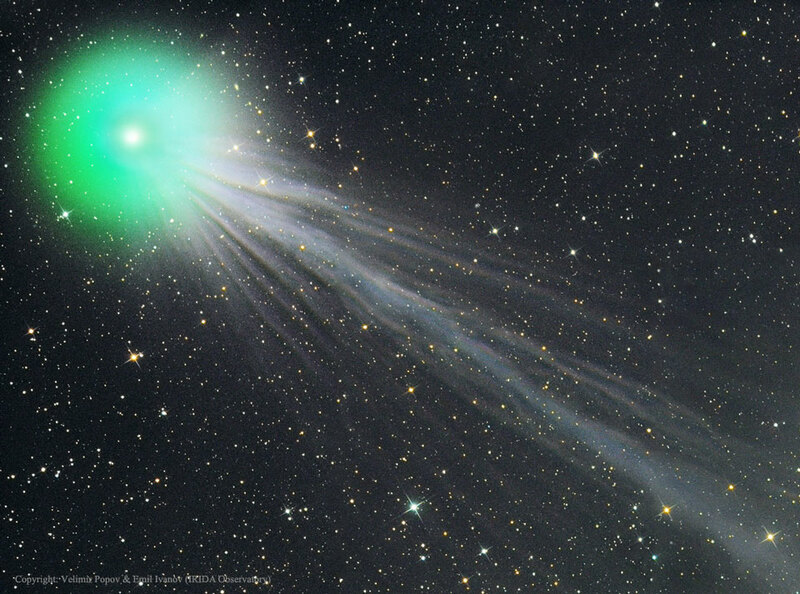 Jim Johnson’s tracking of Comet Loveyjoy, January 24, 2015. Chris Miskiewicz announced that he would be opening one of the Howard Astronomical League dark sites last Monday morning to observe the close conjunction of Venus and Jupiter. I set an alarm for 3:15am, and immediately went outside to check the weather. Upon determining that it was mostly cloudy, I thought it not worth the effort, so I tried to go back to sleep. Fifteen minutes later, I felt that I could not go back to sleep and I knew that Chris would be at the site no matter what, so I jumped in the Jeep and drove out there. The conjoined planets had not yet risen above the eastern horizon when I arrived, but the sky was mostly clear in the area where they would be rising in about 20 minutes. While waiting for them to rise, I took in Orion and the waning crescent moon, which were both already well above the horizon in the same area. They were a beautiful pair both with the unaided eye and in the telescope, so this was a very rewarding trip! Chris’ image below is very close to what I saw without the telescope. I packed up my equipment and headed toward my day job at about 5:35am. Chris Miskiewicz, Jupiter and Venus Conjunction, August 18, 2014. The Howard Astronomical League announced an impromptu star party on the evening of our July meeting, and I went out! My intention was to take my 4″ refractor and mount it on my undriven tripod, and just enjoy some visual observations of objects that I have not seen since last year, and perhaps find something that I have never observed before. Fortunately, I threw my binoculars in the Jeep, because I failed to bring the ring that attaches the telescope to the tripod. I also brought a reclining camp chair that supports my legs like a living room recliner. I had the best time finding summer Messier objects and scanning the Milky Way for about two hours! The point that I would like to emphasize is that it does not take a lot of expensive equipment to enjoy astronomy. Also, I think that Scope Out makes a nice observer’s companion and it is a good starting point for planning an observing session.